If you’re looking for a good place for your little one to burn off some energy, search no further than Pennsylvania’s colorful, expansive, and welcoming play centers. From giant inflatable playlands to massive family fun zones, here are the best kids’ play centers in the state. With over 5,000 square-feet of play space to enjoy, it’s hard for kids to leave Jumpers without a smile on their face. There’s a three-tier soft play unit, giant safari slide, jungle-themed obstacles, and even a play area for the little cubs. Join in on the “Safari of Fun” for only $8 or $9 dollars (depending on the day) and get to Jumpers today! For open-jump availability, jump on over to the home page. Featuring nine luxury playhouses, Tiny Town is a hands-on, interactive play center for children that aims to stimulate children’s curiosity and creativity through play. And Tiny Town isn’t just for kids—it was built with mom and dad and caregivers in mind, too. While children play, they, too, can enjoy themselves at the coffee bar and cafe. The mission at Smith Memorial Playground & Playhouse is simple: to provide children with opportunities for “unstructured free play.” With a six-and-a-half-acre playground containing more than 50 pieces of play equipment for children ages 10 and under and a 16,000-square-foot playhouse, there’s no shortage of opportunities for them to have fun. Smith is closed on Mondays and holidays, but is open to children accompanied by adults on all other days. The sensory gym at Kids at Play is open to toddlers to 12 year-olds for open play at scheduled times. There’s a zipline, roller coaster car, ball pits, sensory room, art room, and so much more—and you can find open play times on their website. In addition to offering open play and birthday packages, kids at play also offers physical therapy, speech therapy, and occupational therapy, so the fun never has to stop—even when it’s time to get to work. You know what’s fun for the whole family? Jungle Wonder is. 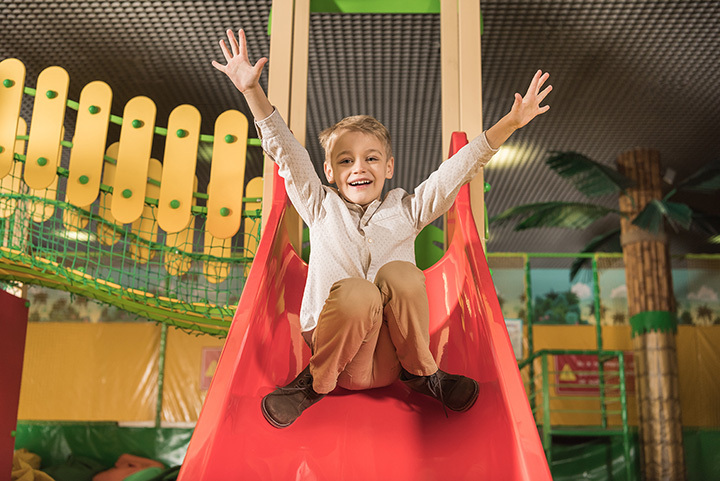 There are many great attractions to keep everyone entertained—like a jungle gym, laser tag, bowling, toddler bounce, and blacklight mini-golf...just to name a few! Pay for a few single attractions or the whole shebang. You’re guaranteed to have a great time no matter what. Here’s an insider tip: on Tuesdays, all attractions are half off, and on Fridays, any three attractions are just $10! When it comes to play centers with unique attractions, the Oasis is the place for kids to be. There’s a playground, of course, and games, but there are other unique attractions too. We’re talking a laser maze, trampoline basketball, and a climbing wall, kids! So, what are you waiting for? Quench your thirst for fun at The Oasis today. Parties at Bette’s are where it’s at. Whether your child is turn eight or 16, there’s fun to be had here by all. Among the many attractions, you’ll find skeeball, bounce houses, an arcade, games, and other fun activities. Come for a party, or come just to let the kids’ burn off some energy—either way, they’re sure to have a grand time. The Little Pod is an indoor playground, but that’s not all. It’s also a birthday party spot, tumbling mat, and the place to be for children’s music and fitness classes. Open play is available all day, seven days a week, and there’s even free Wi-Fi, so parents can keep themselves entertained while the kids play. Jumpin Jacks is, as you might have guessed, an inflatable playland that’s fun for children of all ages. (And adults, too, because let’s be honest...who doesn’t love to bounce around?) For information on open play availability and events, check out the calendar on their website. Then jump right on over! There’s no shortage of things to do at Go ‘N Bananas. There are laser mazes, a ropes course, game zones, laser tag, a toddler zone...and that’s not even the half of it! Go B-A-N-A-N-A-S at Go N’ Bananas today!